Sensitivity differences within these "target" groups are often described by statistical distributions using the species sensitivity distributions (SSDs) concept (Figure 15). 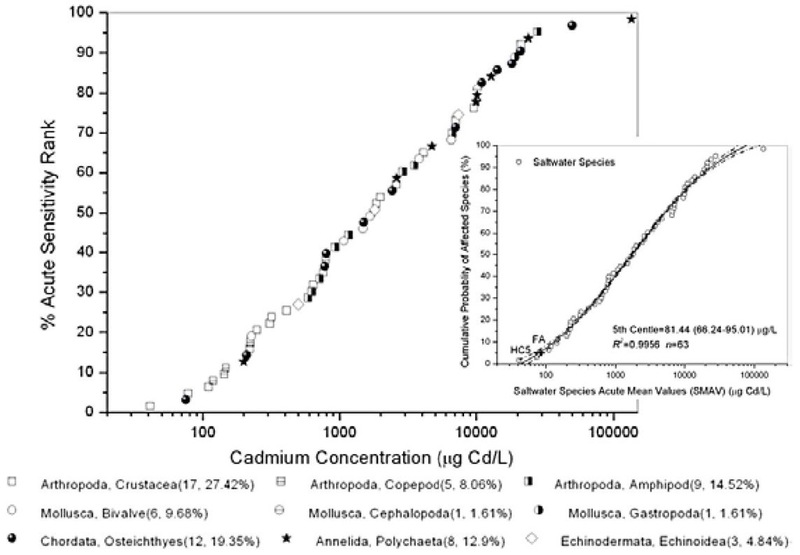 In this figure, acute cadmium saltwater toxicity data were available for 61 species. Toxicity values ranged from 41.3 ^g/L for the Mysid to 135 mg/L for an oligochaete worm. Copepods appeared to be the most sensitive zooplankton and Striped bass was the fish family most sensitive to acute saltwater cadmium exposures. Figure 15. Species Sensitivity Distributions (SSDs) and Logistic Regression of Various Trophic Saltwater Organisms for Acute Cadmium Toxicity Values. The primary toxicity benchmark used for this risk assessment was the 5th percentile of species sensitivity from acute exposures (protection the 95% species). The implied assumption of this approach is that protecting a large percentage of species assemblage will also preserve ecosystem structure and function when using this benchmark. The acute 5th percentile value was selected for the following reasons: (1) based on laboratory experimental data, dissolved and bioavailable cadmium are in the water column of the aquatic environment for only short periods of time that are more closely related to acute exposures that chronic exposures; (2) exposure duration data presented in the ”Exposure Characterization” section showed that spike concentrations of cadmium are shortlived (hour to days) in the environment (e.g., cadmium rapidly complexes with natural organic particulates); and (3) toxicity data are much more numerous and represent a wider range of trophic groups for acute studies than chronic studies (Schuler et al., 2008). The saltwater 5th percentile values (concentration protecting the 95% species) for all species derived from the saltwater acute cadmium toxicity database in figure 15 was 81.44 ^g Cd/L, which is below the SMAVs (Species Mean Acute Values) for the mysid, Mysidopsis bigelowi (110 ^g Cd/L), copepod (adult), Acartia tonsa (118.7 ^g Cd/L), and cladoceran Moina monogolica (>1.0 mg Cd/L), but is greater than the SMAV for the mysid, Americamysis bahia (41.3 ^g Cd/L), and aproximately the SMAV of the American lobster, Homarus americanus (78 ^g Cd/L). Although the saltwater acute cadmium database did not include any macrophyte data and the phytoplankton data were also limited, the most sensitive plant species is more resistant than the chronically most sensitive animal species tested after compared. Therefore, cadmium Water Quality Criteria (WQC) that protects saltwater animals should also protect saltwater plants. These toxic values of cadmium to various saltwater organisms through waterborne and dietary sources may have important relevance to environmental scenarios in natural aquatic systems as well as consequences on cadmium WQC. Figures 15 illustrates that while most acute effects occur at cadmium exposures of ^g to mg/L, for chronic effects the concentrations of cadmium that evoke the various end points are as low as the ^g to ng/L although chronic cadmium toxicity data for saltwater species were few. For example, chronic effects through waterborne routes usually become apparent at concentrations greater than 4.1 ^g Cd/L (Wang et al., 2009a). Similarly, natural zooplankton communities in enclosures of 400 ng Cd/L reduced the abundance of crustacean zooplankton communities, while the abundances of the most sensitive cladoceran species were reduced at 200 ng Cd/L and toxicity to Salmo gairdneri at less than 500 ng Cd/L. Even some species have been reported to be affected at cadmium concentrations less than 200 ng Cd/L and usually after prolonged exposure under laboratory conditions, because these authors noted sublethal adverse effects on zooplankton at 200 ng Cd/L from related experiments and suspected that fish, especially long-lived species, might show effects in the future because they were still accumulating cadmium (Wright and Welbourn, 1994). When green alga, Chlorella pyrenoidosa are exposed to 4.1 ^g Cd/L and resulted in algal cadmium burden of (2.85±0.76)*10-16 g Cd /Cell (Figure 12), 59.06% of total neonate production was reduced for Moina monogolica exposure to dietary routes (Figure 13). For risk assessments of the surface saltwater, distributions of actual measured concentrations of cadmium in the Changjiang estuary of China were compared to distributions of toxicity effects data from laboratory studies. These values (Figure 2) were significantly lower than the acute toxicity values (i.e., 5th percentile of species sensitivity and LC50s) and EC50 of algae (Table 3), but greater than the chronic toxicity values (NOEC, LOEC and MATC (maximum allowable toxicant concentrations) from chronic studies) (Wang et al., 2009a). So the potential acute risk to aquatic organisms from cadmium in surface water was low, because acute toxicity generally occurs over the microgram or milligram per liter range. However, chronic risks in salt-water from cadmium exposure in surface water and pore water of sediment is significantly higher than acute risks. Cadmium chronic effects of waterborne (Wang et al., 2009a) and dietary sources (Figure 13) were compared against Marine Seawater Quality (GB 309797) that was issued by China Ministry of Environmental Protection and State Oceanic Administration (CMEP-SOA, 1998) in order to prevent and control marine seawater pollution, protect the marine life and resource, take advantage of marine resource sustainable use, maintain marine ecological equilibrium, and protect human health. GB 3097-97 has three standard criteria for cadmium. The primary seawater standard criteria, which is the most strict as 1.0 ^g Cd/L, is applied to protecting habitats for fishery, marine life including natural, rarer, and endangered species. The secondary standard criteria as 5.0 ^g Cd/L is applied to regulating foods industrial use, aquaculture, human recreation, and sports, and coastal tourism; and the tertiary standard criteria as 10.0 ^g Cd/L is for defining harbors and ocean exploration. Unfortunately, thresholds (NOEC, MATC and LOEC) (Wang et al., 2009a) all lower than the current WQC of secondary standard criteria (i.e., 5 g Cd/l), which were compared because M. monogolica was cultured in high numbers as a food organism for aquaculture in China. So this value of criteria was considered to be high and may not protect M. monogolica or other relevant species from the chronic effects of cadmium. Furthermore in Canada, the existing guideline for cadmium was also "not sufficient to protect soft water systems from the effects of cadmium because they do not prevent long term accumulation of cadmium in sediments and biota". Guidelines or criteria of cadmium are normally in the order of nanograms per litre for the protection of human health (e.g., in drinking water) or in the 100s of nanogram per liter range for aquatic life based on chronic toxicity (e.g., in water quality guidelines) (Wright and Welbourn, 1994).